Since you spend so much time in your kitchen, it makes sense that it would have the most light out of all the rooms in your home. Instead of opting for traditional windows in your walls, why not look for windows that offer a dramatic change in expectation? Take a page from sunroom design by turning one wall of your kitchen into a wide bank of windows that adorn the ceiling, too. These sturdy windows, meant to withstand the harshest of the seasons and the fierce storms that can come along with them, are perfect for allowing a great deal of light into the house while giving you a fantastic view of the outdoors. Can you imagine having a late breakfast with the rising sun, or watching the sun set in the evening as you entertain guests? 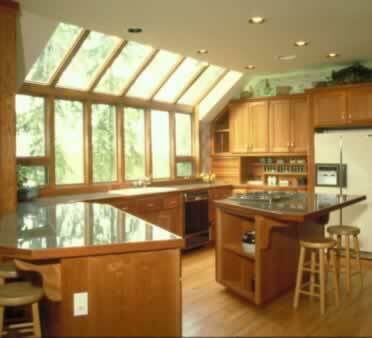 Finish the look with skylights and recessed lighting to make your kitchen the brightest room in the house.